I was all ready for spring. Each year our weather seems to provide such a tease. We get a week or so of 50-60 degree weather and I start thinking - YES----SPRING!!!!!! I start packing up my sweaters, put the kids snowpants and boots away, and anything below 40 degrees seems extremely freezing to me. Then.....as upstate New York seems to do every year - I get tricked. Darn you lake effect snow!!!! The only positive to this whole winter trickery is of course --- the unexpected snow day. It's what teachers, who are really just big kids, live for. Am I right??? So here we are, on the last day of winter and I am home with my kiddos for a snow day. I guess if it has to snow and prolong the arrival of spring, at least I can get a snow day out of it. This gives me the perfect opportunity to introduce some new items I've been working tirelessly on. My kids were having a tough time as we moved into digraphs and blends. Not the entire class, but those little lovelies who just can't seem to hold anymore new sounds in those brains right now. So it was time to turn into something a little more fun and give them a visual to hold onto. 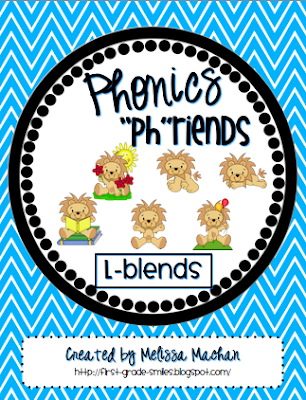 And then the Phonics "Ph"riends were born - not literally of course! I had so much fun thinking of all the little characters I could use for these packs. So far I have finished the Digraphs (ch, wh, th, sh) and started the Blends. I am also planning on making some packs for short and long vowels to start the year off next year. The practice pages in my packs are so much more interactive and motivating then your typical worksheet that we have in our basal program. I am so excited to keep working on new packs to take us through the whole year. Here is a glimpse into these first two packs, and at the bottom you will find a link to my Tw-Blend FREEBIE. The digraph pack has over 70 pages of fun. 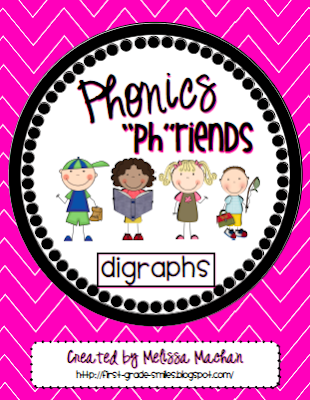 There are Digraph reference cards and mini-posters, Digraph "Ph"riends posters, mini-books, tons of printables for each digraph, and centers. The L-Blend packet has over 50 pages of fun. Again, you will find L-Blend reference cards and mini-posters, L-Blend Lions posters and mini-book, printables and centers. Here is the Tw-Blend FREEBIE!!!! I just love the Twin Turtles for this one - so cute! 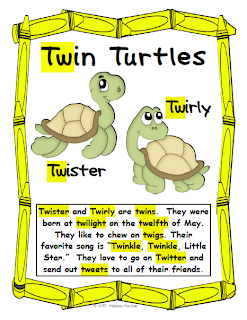 This one also has reference posters, mini-book, printables, and centers. Click on the pictures to grab your own copy. I'm hoping that in a week the weather outside will look MUCH MORE like Spring!!!!! You are so close to me!!! We had a snow day too. Whatever Chittenango does...Cazenovia does!!! Enjoy your day! 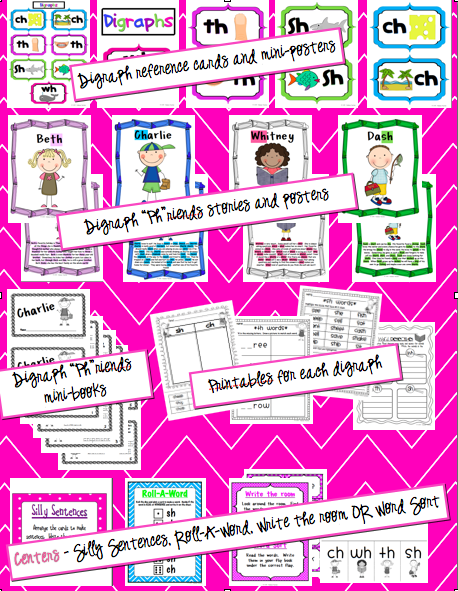 I love the Digraph products! So CUTE!!! Thanks for the freebie! I can't wait to use it! Cute freebies! This year I made a digraph packet with different crafts. My students loved completing anything that is craft related. The posters are too cute! Would love to win! I usually try to read a book with a title or story that has the diagraph or blend that we are learning! I love this! To teach blends I always create an anchor chart with lots of words and pictures. My students love visuals! I really like the posters you have (picture card with the blend). I like to introduce the digraph the first day (a cute story would be a fun way to do it). Then we practice spelling words with the digraph. Next, we brainstorm words with that digraph...or any spelling/phonics pattern...on an anchor chart that I keep up for a few weeks. I also like to have them search through books they read for the words. Maybe add a recording sheet if they go on a "word hunt" to your packet?? They look great already : ) Hoping to win! I like the charts! We use Saxon Phonics and their posters are so ugly. I like to use different posters and add stuff to it. Thanks! Thank you for the freebie! 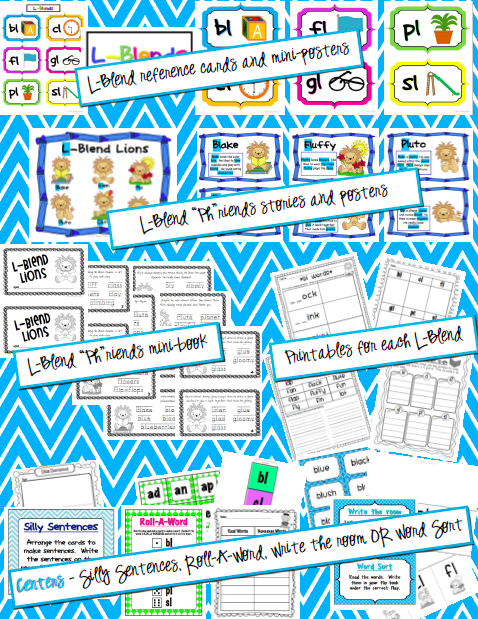 Visually appealing anchor charts and phonics sorts would be great! So jealous of your snow day. We had NOTHING. Not even a delay. I think this is the year without a snow day for Bville. Boo. LOVE your packs! We use the Treasures reading series, and I don't usually like how they teach phonics. Their worksheets are lame, too! Your printables look great and so do the stories. So cute! I woke up to snow this morning. Brrr... Your packet looks awesome.